Preface. 1. Introduction to RNA-Protein Interactions. 1.1. RNA secondary structures. 1.2. RNA tertiary structures. 1.3. Protein motifs involved in RNA binding. 2. Preparation of RNA. 2.1. Working with RNA. 2.1.1. Special precautions when working with RNA. 2.1.2. Basic protocols for RNA work. 2.2. Isolation of RNA from cells. 2.2.1. Guanidinium thiocyanate - CsC1 method. 2.2.2. Single step guianidinium thiocyanate acid-phenol method. 2.2.3. Hot phenol method-SDS method. 2.2.4. Vanadyl ribonucleoside complex method for preparation of nuclear and cytoplasmic RNA. 2.2.5. Purification of poly-A+ RNA. 2.3. In vitro synthesis of RNA. 2.3.1. In vitro transcription of RNA. 2.3.2. Co-transcriptional labelling or modification of RNA. 2.3.3. End-labelling of RNA. 2.3.4. Specific modification of RNA at an internal site. 3. Preparation of Protein. 3.1. Isolation of protein from cells. 3.1.1. Preparation of HeLa cell extract. 3.1.2. Purification of SR proteins from nuclear extract. 3.2. Expression and purification of recombinant proteins in E.coli. 3.2.1. Expression of recombinant proteins in E. coli. 3.2.2. Purification of GST-tagged proteins under native conditions. 3.2.3. Purification of His-tagged proteins under denaturing conditions. 3.2.4. Labeling of protein using heart muscle kinase. 3.3. In vitro translation. 4. Preparation and Analysis of RNA-Protein Complexes In Vitro. 4.1. Formation of RNA-protein complexes. 4.2. Analysis of RNA-protein complexes. 4.2.1. Filter binding assay. 4.2.2. Mobility shift analysis. 4.2.3. Sucrose gradient analysis. 4.3. Isolation or identification. 4.3.1. Affinity purification using tagged RNA or protein. 4.3.2. UV cross-linking. 4.4. RNA footprinting. 4.4.1. Enzymatic probing. 4.4.2. Chemical probing. 4.4.3. Identification of modified residues. 4.5. Protein footprinting. 4.5.1. Protein footprinting using proteinases. 4.5.2. Protein footprinting using Fe2+/H2O2. 4.5.3. Preparation of Tris/Tricine-SDS-polyacrylamide gels. 4.6. Modification interference. 4.6.1. Base modifications. 4.6.2. Phosphate modification by ENU (ethylnitrosourea). 4.6.3. Analogue interference. 4.7. SELEX. 5. 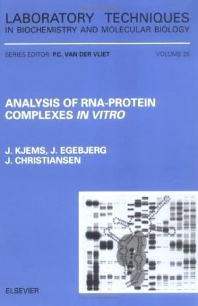 Functional Analysis of RNA-Protein Complexes In Vitro. 5.1. Pre-mRNA splicing. 5.1.1. In vitro mRNA splicing. 5.1.2. Analysis of RNA splicing products by denaturing gel electrophoresis. 5.1.3. Analysis of RNA splicing complexes by native gel electrophoresis. 5.1.4. Debrancing of RNA lariats. 5.1.5. Analysis of RNA splicing complexes by sucrose gradients. 5.1.6. Affinity purification and characterization of splicosome complexes. 5.2. Polyadenylation. 5.2.1. In vitro polyadenylation. 5.2.2. Analysis of mRNA polyadenylation states. 5.3. RNA modification. 5.3.1. Reverse transcriptase-polymerase chain reaction (RT-PCR). 5.3.2. Primer extension by Klenow polymerase (after RT-PCR). 5.3.3. Primer extension by reverse transcriptase. 5.4. Translation. 5.4.1. Preparation of ribosomes. 5.4.2. Preparation and analysis of polysomes. The central role of RNA in many cellular processes, in biotechnology, and as pharmaceutical agents, has created an interest in experimental methods applied to RNA molecules. This book provides scientists with a comprehensive collection of thoroughly tested up-to-date manuals for investigating RNA-protein complexes in vitro. The protocols can be performed by researchers trained in standard molecular biological techniques and require a minimum of specialized equipment. The procedures include recommendation of suppliers of reagents.